Even Harmony's statistics are awesome. Built in St. Nazaire, France, she made her debut this year. 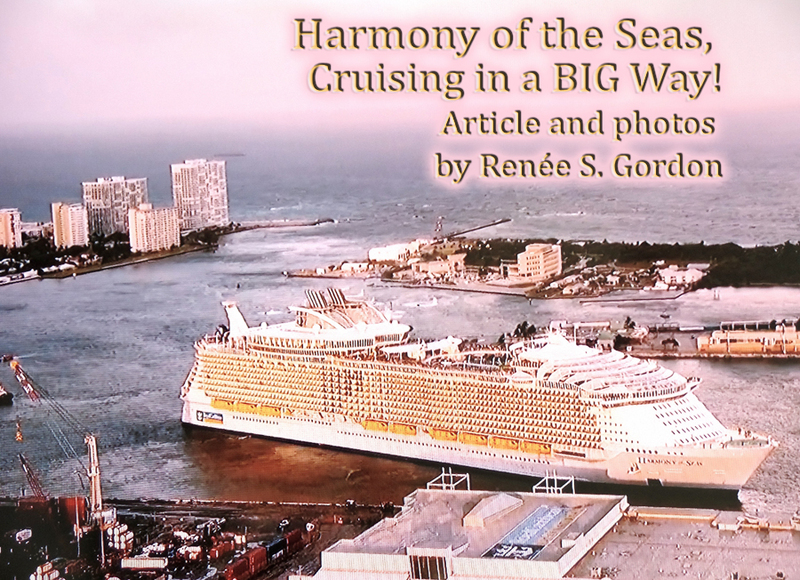 The ship is 215.5-ft. wide, 1,188-ft. long and has a total of 16 guest decks with 2,747 staterooms. It is designed to accommodate a total of 6,780 guests and 2,100 international crewmembers, approximately one crewmember for each 2.5 guests, to ensure unparalleled, personalized service. There are rooms and suites to suit all tastes and budgets and include inside, outside, balcony, handicapped accessible and virtual balcony cabins. Virtual balcony cabins are definitely an example of Royal Caribbean's dedication to cutting edge technology. Rooms without a balcony or window tend to allow guests to lower the expense of the trip but can make one feel slightly claustrophobic. That was rendered a nonissue with the debut of staterooms with a virtual balcony. These rooms feature a floor to ceiling, wall to wall, 80-inch high definition screen that provides real-time views and sounds of the passing sea. Red Epic HD cinema cameras are located on the bow and the stern for optimum viewing. The projection includes a balcony and a railing to enhance the feeling of security and guests have the option of closing the drapes if the beauty of their surroundings overwhelms them. 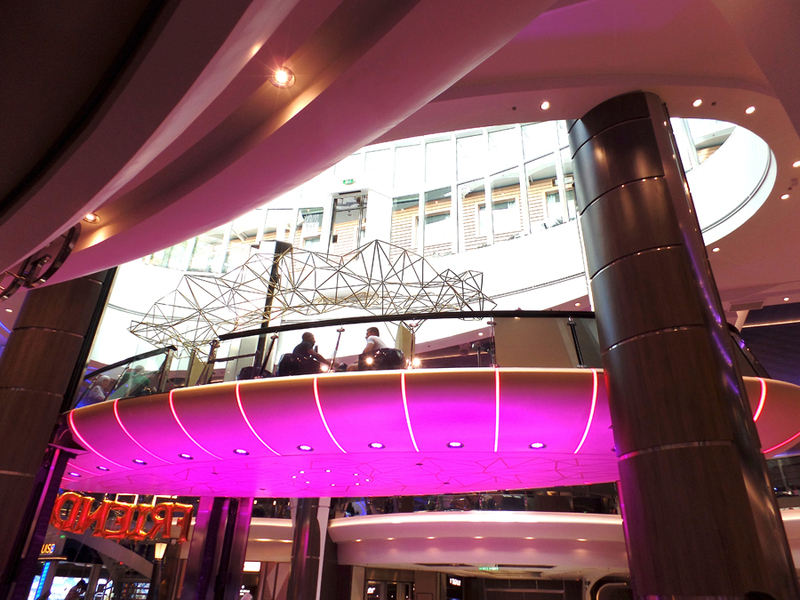 Harmony of the Seas has more than 15 restaurants, including 8 specialty restaurants that are themed to the seven neighborhoods on the ship. Together they serve more than 200 different meals and 340 brands of wine daily. The Bionic Bar and the Rising Tide Bar, located on the Royal Promenade successfully segue from dining to entertainment. Robotic bartenders in the Bionic Bar serve their signature drink and allow guests to create their own. 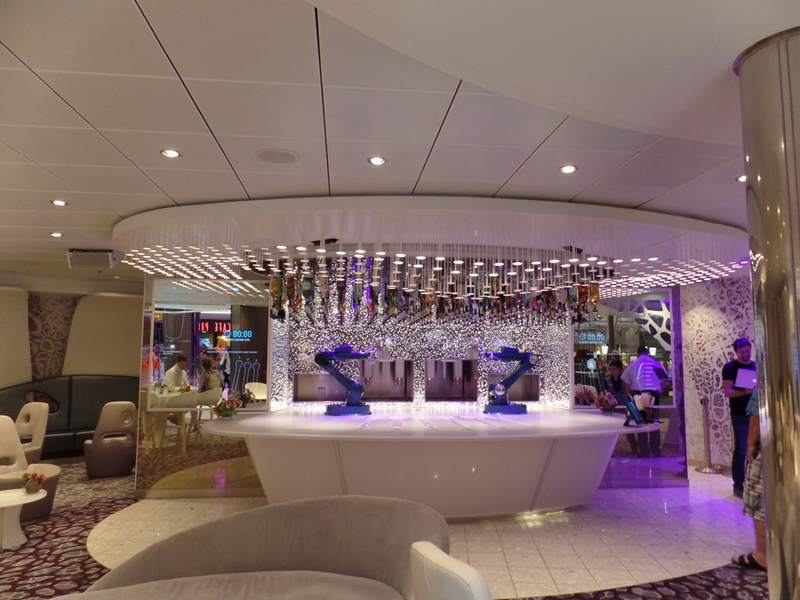 The Rising Tide Bar lets you enjoy a drink while floating gently to an upper deck and enjoying the view. Dining and accommodations on board are wonderful but what really sets Harmony apart is the variety of adrenaline activating mini-adventures offered throughout the day during the length of your voyage and between ports of call. 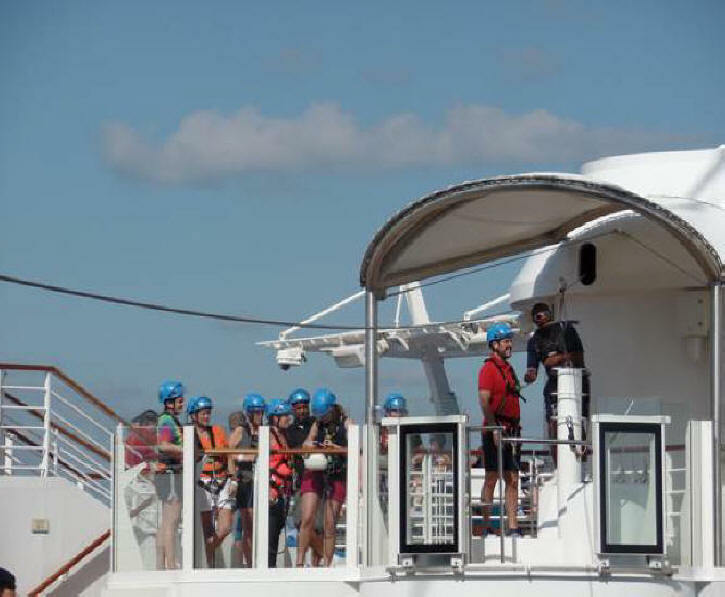 Two walls are available for rock climbing on Deck 6 or you can head up to Deck 16 to Zip Line nine decks high. Guests can also perfect their surfing skills on the Flowrider. The two most popular rides are The Perfect Storm and The Ultimate Abyss. The Perfect Storm, three connected water slides, Cyclone, Monsoon and Typhoon will leave you breathless. You can look forward to regaining your voice on a trip down The Ultimate Abyss. This 10-second, 10-story intense trip is experienced while prone on a padded cushion. Neither ride is for the faint-hearted. If you are still in search of something to do there are Broadway-style shows, shopping for souvenirs from small shops to Cartier and Bvlgari. After all that fun you can rest, relax and rejuvenate at poolside or with the special services in the spa.